water level create a fantastic scene. A very natural beauty of an artwork that fits with many designs. After two days of nonstop we arrived at the Chobe River in Botswana. Coming about 2700 km from Cape Town via Maun with my own car, equipped from wheels to roof with everything that you can think of when going on a self-drive safari trip to, at that time to me still unknown territory. The uncertainty lessened as the long journey to get here somehow calmed of what to expect. I was so excited to try many different opportunities to capture the African Wildlife we would come across. We set camp close to the river, about ten km before where the junction of the Chobe River and Zambezi Rivers. The riverbed lined with lush vegetation surely showed the enormous rainfalls that they had a few weeks ago, leaving some lodges, camps and even roads still flooded and impassable. Hence the water levels of the river were high when we chartered the boat to explore the river downwards. Hoping for some interesting angles from the water, I anticipated capturing the wildlife appearing at the river’s edge. We cruised for about two hours, yet it seemed for 2 days. The river’s edge kept quiet – no occurrences of a possible exciting scene. Focusing on the land across the river I almost missed the group of Hippos raising out of the water. I set up my camera very low to gain a powerful perspective when they would appear on the water’s surface again. 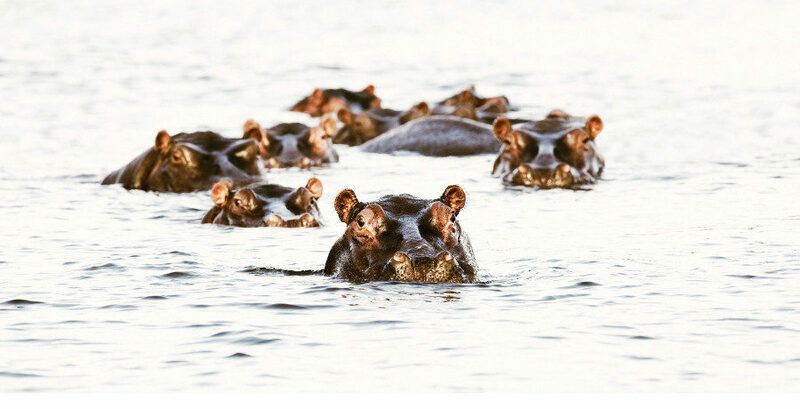 As we switched off the motors, the boat was floating towards the group of hippos. Quite a feeling when you know some creatures are below you but you don’t know exactly where they will pop up next! My eyes did not leave viewfinder, as I knew I had to be quick. It was a game of seconds when I pressed the shutter. The luck was on our side as five of the hippos looked directly into my eyes, like they were posing for my camera!